Athenagoras I (Greek: Αθηναγόρας Αʹ), born Aristocles Matthew Spyrou (Greek: Αριστοκλής Ματθαίου Σπύρου; 6 April [O.S. 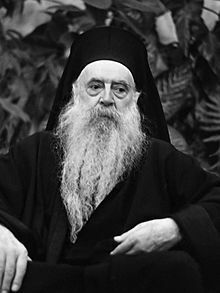 25 March] 1886 – July 7, 1972), initially the Greek archbishop in North America, was the 268th Ecumenical Patriarch of Constantinople, from 1948 to 1972. Athenagoras was born to a Greek family as Aristocles Matthew Spyrou on April 6 [O.S. March 25] 1886 in the village of Vasiliko, near Ioannina, Epirus (then Ottoman Empire). He was the son of Matthew N. Spyrou, a doctor, and Helen V. Mokoros. Athenagoras devoted himself to religion at an early age because of the encouragement he received from his mother and a priest from his village. After completing his secondary education in 1906, he entered the Holy Trinity Theological School at Halki, near Istanbul, and was ordained a deacon in 1910. Upon graduating, he was tonsured a monk, given the name Athenagoras, and ordained to the diaconate. He served as archdeacon of the Diocese of Pelagonia before becoming the secretary to Archbishop Meletius (Metaxakis) of Athens in 1919. While still a deacon, he was elected the Metropolitan of Corfu in 1922 and straightway raised to the episcopacy. Returning from a fact-finding trip to the Greek Orthodox Archdiocese in America in 1930, Metropolitan Damaskinos recommended to Patriarch Photios II that he appoint Metropolitan Athenagoras to the position of Archbishop of North and South America as the best person to bring harmony to the American diocese. The patriarch made the appointment on August 30, 1930. When Archbishop Athenagoras assumed his new position on February 24, 1931, he was faced with the task of bringing unity and harmony to a diocese that was racked with dissension between Royalists and Republicans (Venizelists), who had virtually divided the country into separate dioceses. To correct that, he centralized the ecclesiastical administration in the Archdiocese offices with all other bishops serving as auxiliaries, appointed to assist the archbishop, without dioceses and administrative rights of their own. He actively worked with his communities to establish harmony. He expanded the work of the clergy-laity congresses and founded the Holy Cross School of Theology. Through his capable and fatherly leadership he withstood early opposition and gained the love and devotion of his people. Archbishop Athenagoras consecrated the Archdiocesan Cathedral of the Holy Trinity on New York City's Upper East Side on October 22, 1933. He called it: "The Cathedral of all of Hellenism in America." In 1938, Athenagoras was naturalized as a United States citizen. On November 1, 1948, he was elected Patriarch of Constantinople at the age of 61. In January 1949, he was honored to be flown in the personal airplane of the American president Harry Truman to Istanbul, Turkey to assume his new position. As Patriarch, he was actively involved with the World Council of Churches and improving relations with the Roman Catholic Pontiff, the Pope of Rome. He was hospitalized on July 6, 1972 for a broken hip, but died from kidney failure in Istanbul (Constantinople) the following day at the age of 87. He was buried in the cemetery within the grounds of the Church of Saint Mary of the Spring in Balıklı, Istanbul. Statue of the Ecumenical Patriarch Athenagoras I of Constantinople in Chania (Crete). Athenagoras's meeting with Pope Paul VI in 1964 in Jerusalem led to rescinding the excommunications of 1054 which historically mark the Great Schism, the schism between the churches of the East and West. This was a significant step towards restoring communion between Rome and Constantinople and the other patriarchates of Orthodoxy. It produced the Catholic–Orthodox Joint Declaration of 1965, which was read out on December 7, 1965, simultaneously at a public meeting of the Second Vatican Council in Rome and at a special ceremony in Constantinople. The controversial declaration did not end the 1054 schism, but rather showed a desire for greater reconciliation between the two churches, as represented by Pope Paul VI and Ecumenical Patriarch Athenagoras I. Not all Orthodox leaders, however, received the declaration with joy. Metropolitan Philaret of the Russian Orthodox Church Abroad openly challenged the Patriarch's efforts at rapprochement with the Roman Catholic Church fearing it would lead to heresy, in his 1965 epistle to the Patriarch. ^ Goff 2010, "Eastern Orthodox Christianity", p. 537. ^ a b c d Block, Rothe & Candee 1950, "Athenagoras I, Patriarch", pp. 14–15: "Born March 25, 1886, in Vassilikon, near Janina in the Greek province of Epirus (at that time a part of the Ottoman Empire), the Patriarch, who is of Hellenic stock is the son of Matthew N. Spyrou, a physician, and Helen V. (Mokoros) Spyrou. His baptismal name was Aristocles Matthew Spyrou. Strongly encouraged by his mother and by "the humble priest" of his village (the quoted words are the Patriarch's own), the boy early resolved to devote his life to religion; and in 1906, after completing his secondary education at the Greek school on the island of Halki, near Istanbul, he entered the Holy Trinity Theological School on Halki. The thesis he submitted he submitted for ordination dealt with the election of the Ecumenical Patriarch of Constantinople from the beginning up to the year 1453. On being ordained deacon in 1910..."
^ a b "Cathedral History". Archdiocesan Cathedral of the Holy Trinity. 2014. Archived from the original on 7 December 2012. Retrieved 26 July 2014. ^ Block, Rothe & Candee 1950, "Athenagoras I, Patriarch", pp. 14–15. ^ a b Cianfarra 1950, p. 87. ^ Chrissochoidis 2013, p. 131. ^ Newsweek 1972, p. 172: "Died: ATHENAGORAS I, 86, Ecumenical Patriarch of the Eastern Orthodox Church, spiritual leader of 125 million Eastern Christians, of kidney failure while hospitalized for a broken hip, in Istanbul, July 6. The Greek-born, white-bearded, 6-foot 4-inch prelate became Ecumenical Patriarch in 1948 after seventeen years in New York as Greek Orthodox Archbishop of North and South America." ^ "Joint Catholic-Orthodox Declaration of his Holiness Pope Paul VI and the Ecumenical Patriarch Athenagoras I". La Santa Sede (Vatican). 7 December 1965. ^ Metropolitan Philaret (December 1965). "A Protest to Patriarch Athenagoras: On the Lifting of the Anathemas of 1054". Orthodox Christian Information Center. Block, Maxine; Rothe, Anna Herthe; Candee, Marjorie Dent (1950). Current Biography: Who's News and Why 1949. New York: H.W. Wilson Company. Chrissochoidis, Ilias (2013). Spyros P. Skouras: Memoirs (1893–1953). Stanford: Brave World. Cianfarra, Camille Maximillian (1950). The Vatican and the Kremlin. New York: E.P. Dutton & Company, Inc.
Goff, Philip (2010). The Blackwell Companion to Religion in America. Malden and Oxford: John Wiley & Sons. ISBN 978-1-44-432409-9. Newsweek (1972). "Time Marches Off". 80. Newsweek, Incorporated. Wikimedia Commons has media related to Athenagoras I of Constantinople.